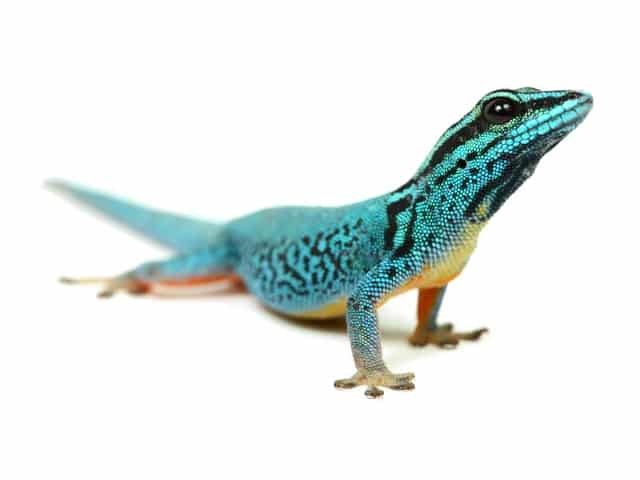 Lygodactylus williamsi is a critically endangered species of gecko also known as electric blue gecko. Males are bright blue with heavy black throat stripes, visible preanal pores, and hemipenile bulges. The females range from brown or bronze to bright green, and have little to no black on their throat. The underside of both sexes is orange. Colours of individuals vary according to mood and temperature. Males may range from black or gray to brilliant electric blue. Females may range from dark brown to brilliant green with turquoise highlights. I keep my adult pairs of williamsi in 0.4 x 0.4 x 0.4 meters (1.3 x 1.3 x 1.3 feet) or 0.4 x 0.4 x 0.5 meters (1.3 x 1.3 x 1.6 feet) PVC terrariums I find these sizes work very well but bigger terraria can also be used. . I would not house adults in anything smaller. It is very important that there are no gaps for the williamsi to escape out of. They are very small and fast and the smallest crack can lead to escapes. I like to use live Sansevieria plants and bamboo pieces placed at different angles to fill out the cage. The bamboo branches should be placed at different heights in the terrarium to allow the geckos to pick their desired temperature throughout the day. No hides are necessary but the terrarium should have several live plants for cover to provide the geckos a sense of security. I use an organic substrate with a drainage layer at the bottom. I use a 50/50 mixture of sand and peat moss. On top of that I use a layer of dry leaves. This helps hold in humidity, allows for direct planting, and creates a bioactive substrate to break down gecko waste. UV lighting is a must. I use 10.0 ReptiSun t8 fluorescents. Each cage has two fluorescents lights, one 6500K bulb and one UV bulb. I also provide a basking spot using a 20 watt halogen puck light. Lights are left on for twelve hours a day for most of the year. For three or four months out of the year the photoperiod is reduced to eight to ten hours a day and temperatures are dropped by about ten degrees to simulate the cool season. I shoot for an ambient air temperature around 25-26°C (77-79°F) during the day and a basking spot temperature of 32-37 °C (90-100 °F). All lights and heat sources should be turned off at nine at normal room temperatures. A water bowl is not used. I mist the geckos three times a day for about one to two minutes each session. The enclosure should be fully covered with mist but all water droplets should evaporate before misting again. Humidity should be high but the cage should not be wet. I do not measure humidity directly but around 60-90% should be good. I use and recommend Pangea Complete prepared fruit diets for this species. I also feed small insects like fruit flies and bean beetles. Adults are fed four times a week and juveniles are fed daily. It is not recommended to handle these geckos. They are very small, fast, delicate, and stress easily from handling. If the geckos need to be moved a small fish net or deli cup is used to contain and transfer them. All waste that drops to the ground is decomposed by the bioactive soil. The front viewing panel, sides of the terrarium, and branches should be wiped clean of feces on a regular basis. With adequate humidity shedding proceeds normally and the geckos will eat most of their shed skin. If patches of skin remain attached then humidity is likely too low. Make sure the terrarium is not saturated with moisture as too wet conditions can also lead to shedding problems. When cared for properly williamsi are very hardy and live for many years with little to no health concerns. It is very important to provide UV light, a calcium dish for females, and not to overwater the terraria. Without UV light williamsi will survive but they will grow slowly and not thrive. If a breeding female is not provided with a small dish of pure calcium powder she will likely not have enough to produce healthy eggs and offspring. This often results in female death or poor hatchling health. Too much water in the terrarium is particularly a problem for hatchlings.